You know the part in the safety instructions on the airplane when they talk about the oxygen masks? They tell you that when the masks come down you first put on YOUR mask and then you can help those around you to put theirs on. That includes small children who really can't do things like that on their own. I have heard it many times. I have been on a lot of planes. However, it wasn't until recently that I have learned exactly why they say that. Our visiting teaching message this month is about self-reliance and it was a hard one for me to swallow at first because at this time in my life there are parts where I feel completely prepared and self reliant and then there are other areas where I have had to humble myself and ask for help. However, while I was giving the message to one of my dear sisters this week, I read a part of the message that talks about being self-reliant spiritually, physically, socially, financially, emotionally, the list could keep going. I thought of something that I have been trying to incorporate in my life upon much coaxing from some around me that know what they're talking about and that is, if I am going to take care of my family and help them and others around me, I must first take care of myself. Much like the oxygen mask comparison, if you yourself are not breathing in the amount of oxygen that you need, how can you help others get theirs? To be self-reliant in areas of our lives that will aid us in taking care of ourselves is very important. As mothers, I think that we especially think of this as an awfully selfish act to do things for our own health, social life, emotional well-being, etc. However, if we don't, we are risking the opportunity to take care of others around us as well as we can. I have appreciated this advice and have tried really hard to incorporate it so that I can better take care of others around me. If that means finding extra time to read my scriptures even if my house doesn't get dusted, or spending time with my mom instead of always being home when my kids get home from school, or a night out with the "girls" instead of staying home and watching one more guy movie with Jeff it will help me be a better mom and better wife and just a better person able to take care of myself and find happiness to share with others and to serve through that happiness. Put on your own oxygen mask first! I agree with you 100 percent! I have the opposite problem; I think I take too much time for myself! I also love the picture of the flight attendant. Made me giggle. 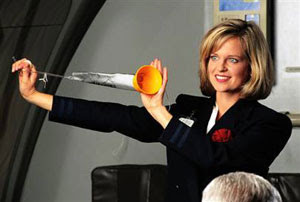 I too loved the flight attendant picture - made me think of Saturday Night Live...haven't watched that in awhile! Great Post, Becca. Thanks for sharing. Here, Here, on the girls nights - they are the only things that have kept me going this month (this will be my 3rd weekend in a row ;)) I'm grateful that my husband sees my need for it and that my friends let me babble all night. Great post Becca! Great post!!! I'm am guilty of falling into the guilt trap that keeps me from taking care of myself. I love girls nights and am so sorry I missed Scrap and Chat.